We carry out Survey, Soil Testing, Design, Excavation, Supply of class A items and execution of foundations and associated Civil Works. We provide Erection of Towers and Shelters including paintings etc. The electrical works carried out are of both Internal and External type including power connection and Liaison with the department concerned. 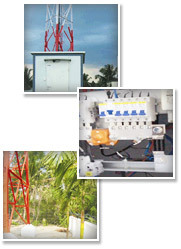 Power backup DG sets, Alarm System for remote monitoring and site earthing system. We manage site related permissions for SACFA / WPC, Local Administrative Bodies including Municipal and pollution Control Board. The above assignments are related to both new and upgrade of sites. 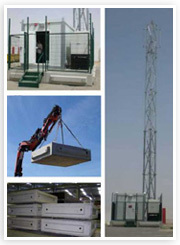 including the tower, shelter, DG, shelter and the fencing can be set in a single day. We at Microqual have devised this unique way of keeping our customers informed of their business we carry out for them. It's the project management portal that enables the customer to keep a track of their project and gives them the freedom to monitor the progress of their work. We provide complete transparency of the business carried out and updated status of project on the basis of milestone based performance. Every Project is being divided in the most relevant milestones and time line wise performance is tracked for each milestone. This enable us and the customer to easily scrutinize the project and speed up the efficient implementation of the project. - Easy access and ease of use. - Data access at each milestone in the Turnkey Project handled. User Friendly the Portal is designed such that if is user friendly and can be accessed by anyone. The Portal gives an idea of all the stages of the turnkey project say civil electrical, Tower erection, Site at Site completion. Unique Project ID One of the featured of this portal is that every site has been allotted a unique project id, so that it is very easy to relate and analyze all of the relevant reports and applicable data for a particular site provide by the MPMS Database. Google Maps the site has an advantage of being viewed on Google maps and also there is a facility of uploading actual images of the site under progress. Hassle free Documentation - Now all the relevant documentations and reports needed are all available at a click to the customer. This available soft copy of site documents makes it easier for customer to know the status of important aspects such as statutory and quality related tasks. This document also helps us in getting ourselves ready for invoicing. Thanks to MPMS invoicing is now a much simpler job in TSP. Ticketing - In case your project milestones are not achieved. The portal has a self triggered emails shooting to the customer's and the vendor's inbox, alerting about the incomplete status of the sites. Customized Reports - Not only this, the customer has the liberty of extracting his customized reports as per his own requirement as against the milestones created by the portal. The portal provides both customized and ready reports which gives ready available database for highly precise analysis of the TSP project from customer's as well as at our end. 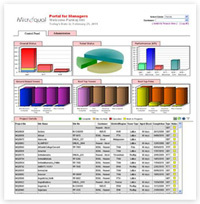 Online Invoicing - The MPMS portal has the capability to incorporate invoicing, revenue generated and expenses paid data for a site which enables us to extract site profitability reports and make ourselves more and more efficient, use resources optimally and become more and more alert and nimble.